We had a perfect relationship with God but we broke it by disobeying God (“… when the women saw that the fruit of the tree was good for food and pleasing for the eye, and also desirable for gaining wisdom she took some an ate it.”). Free Kindle Book thru Dec. 31st! 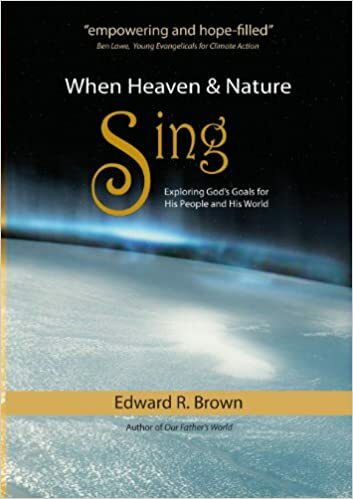 When Heaven and Nature Sing: Exploring God’s Goals for His People and His World by Ed Brown is your for free! Get it now through December 31st. Lowell Bliss, Director and author of Environmental Missions: Planting Chruches and Trees, explains how environmental challenges are actually an opportunity for Christian evangelism and discipleship around the world. Environmental Missions from Lowell Bliss on Vimeo. Intrigued by the idea of environmental missions? Check out the opportunities available on our Missions Opportunities page. In October of 2008, Manila, Philippines was hit by two massive typhoons. According to some reports, 80% of the city experienced flooding, much of it severe. Homes were inundated to the top of the second floor that had never been flooded before. Over 1500 people lost their lives. On the heels of these storms, an environmental seminar, “Hear the Call to Care for Creation” was held that had been planned almost a year earlier. From homes still damaged by flood waters, more than 70 people spent two days together seeking to understand what God might be saying through what was generally understood to be an environmental disaster. Add this seminar to your schedule! Overwhelmed by your seminar choices? Don’t miss this creation care-focused seminar at Urbana 15, led by our friend Ben Lowe: Making Sense of Climate Change: Questions, Solutions, and the Church’s Role. You can find all of these books at InterVarsity Press.